Material: PU Leather + Sponge + 0.8cm Wooden Board(cushion and backrest);Stainless Steel(footrest);Steel(armrest); Elastic lycra material(cushion pad). Cushion size: About 13.4*6.2*1.9inch/34*15.8*4.8cm;Back Rest Size:About 10.6*6.8inch*1.5/27*17.5*3.81cm. Armrest size: About 9. 5x7.5inch(24x20cm). 2.sponge provide comfortable feeling, PU fabric can be cleaned more easily. The product is made of high quality material. 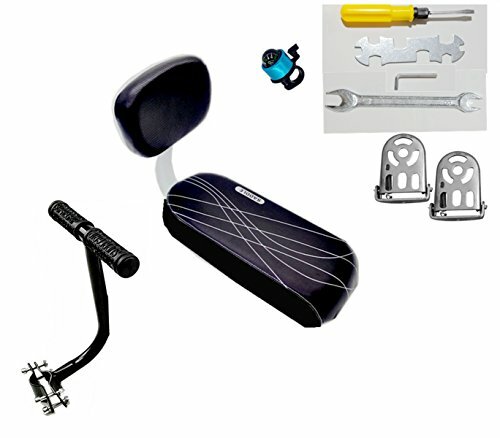 the wide padded seat and backrest ensures a comfortable riding position; the armrest handrail and foot pedals added security for safety, kids can lean back and relax when you are riding; It easy to install and clean, universal for most bikes; A must have accessory to carry your child or friend along with you when riding. If you have any questions about this product by ZHOUWHJJ, contact us by completing and submitting the form below. If you are looking for a specif part number, please include it with your message.